The Canadian Seed Trade Association is hosting a meeting in Kitchener today to discuss the development of a “Co-Existence Strategy” for Monsanto’s Roundup Ready Alfalfa. The Organic Council of Ontario organized a small contingent of people to argue the case that a GE version of alfalfa, a perennial known for its loose gene drift potential, ought not be released based on our current information and understanding. 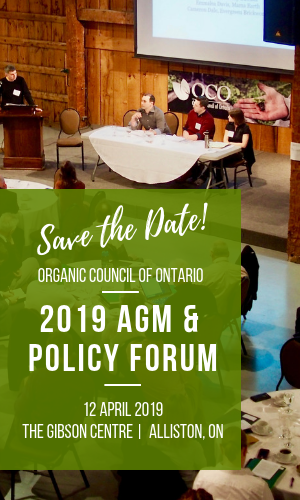 “Markets demanding identity-preserved and organic products are certainly under threat,” added Matt LeBeau, Chair of the Organic Council of Ontario. “Let’s be quite clear: RR alfalfa will lead to increased use of glyphosate- already in overuse in North America; RR alfalfa cannot be contained- there is no mitigation strategy being put forward by the biotech sector that places responsibility for damage and lost markets or biodiversity with the biotech sector; and sufficient safety and gene drift and transfer data has not been conducted for a sufficient amount of time.” The meetings today will be an opportunity to put forward the concerns of agronomists, producers, consumers and retailers with whom the Organic Council of Ontario has consulted over the past two years on this issue. Canada has already approved the GE alfalfa for consumption, all that stands in the way of full commercialization is seed variety registration. The USDA’s surprise decision to deregulate GE alfalfa with no restrictions in 2011 means that US farmers are already able to plant this perennial GE plant despite a case challenging its release currently before the courts. Contamination of the seed supply, identity-preserved fields, and organic fields is inevitable. ‘When we give up on GE Alfalfa, claiming there is room for “co-existence” of GE and organic alfalfa production, we give up on organics,” added Mr. LeBeau. In March 2010, more than 244,000 people submitted comments to the USDA critiquing the substance and conclusions of its Draft EIS on GE Alfalfa. In addition, more than 300 public interest organizations, farmers, dairies, retailers and organic food producers from the U.S. and Canada, including the Organic Council of Ontario, called upon the USDA to deny approval of GE alfalfa. The USDA’s own Environmental Impact Statement found that allowing unrestricted cultivation of GE alfalfa will increase the use of glyphosate and create the risk of contamination of non-GE crops. Harm incurred by organic and non-GE farmers and food companies from GE contamination include: lost markets, lost sales, lower prices, negative publicity, withdrawal of organic certification, expensive testing and prevention measures, and product recalls, among other things. In at least one case —canola — pervasive GE contamination eliminated an entire organic sector in Canada. In another instance, the alfalfa seed fields of Dairyland Seed Company, Inc., a major US alfalfa seed producer, were contaminated at eleven out of sixteen sites at distances up to 2.4 km. This contamination occurred despite the required 274m isolation distance. The seed fields of Cal/West Seeds, a farmer (seed grower) owned cooperative and major alfalfa seed exporter, were contaminated in a California foundation seed field and in a Wyoming seed field. The key value proposition for the organic sector is organic integrity- something consumers care deeply about. GE agriculture is fundamentally in conflict with organic agriculture. Consumer polls show one of the main reasons people buy organic food is to avoid GE ingredients. Credibility and markets are lost when GE contamination goes unchecked- as seen recently with flax contamination fall out in Canada. Most perplexing is the lack of accountability on the polluter’s part when a contamination “event” occurs and the organic sector picks up the tab for the “collateral damage” of GE agriculture. “Biotech advocates argue a moratorium on approving GE Alfalfa limits choice for farmers,” added Ted Zettel. “Yet it seems lost on the pro-biotech voices that GE alfalfa on the market limits choices for every other farmer wishing to propagate GE free varieties when we accept that GE pollution is inevitable. This issue is not simply an organic sector issue: GE alfalfa has repercussions for ALL agricultural producers selling into markets that do not permit GE foods- including major trading partners Japan and the EU. GE alfalfa could close borders for all livestock products into these and other GE-free markets,” he warned. For media inquiries, please contact Jodi Koberinski, Executive Director, Jodi@organiccouncil.ca or by phone: 519-827-1221.